Tens of thousands of Liberians who have registered as refugees in neighbouring Guinea are abusing their status by crossing the border to trade their food rations and prepare their eventual return before returning to their camps for the next handout, aid workers said. Strictly speaking, someone who can enter his or her own country without fear does not need to be protected and should not be getting UN refugee assistance. Aid workers admit that this unofficial flow of food across the border is probably helping to keep thousands of needy people fed in outlying districts of war-ravaged Liberia, where rebel gunmen still control the border. Recent attempts to clamp down on wandering Liberian refugees by counting the population that is actually resident in four official refugee camps in Guinea's southeastern Forest Region have sparked violence. Cars have been being smashed and UN workers stoned as aid workers try to check their suspiscions that the real number of Liberian refugees in the country is well below the official figure of 90,750, on which current aid levels are based. “We have been completely manipulated by some of the refugees,” said Cesar Pastor-Ortega, head of the refugee agency UNHCR in Nzerekore, the capital of the Forest Region. “By our own estimates we think that around 80,000 refugees have already made at least a partial return to Liberia, with about 35,000 part-time resident in Voinjama alone,” he said. 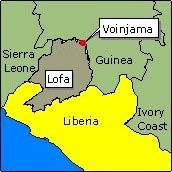 Voinjama is the headquarters town of Lofa county in northwestern Liberia and lies just 20 km from the border. It has long served as the headquarters of the Liberians United for Reconciliation and Democracy (LURD) rebel movement, which waged war against former president Charles Taylor from rear bases in Guinea between 1999 and 2003. Pastor-Ortega told IRIN that in early June he was personally attacked by stone-throwing residents of Kouankan refugee camp, less than 100 km from the Liberian border, as a UN team tried to conduct its first head-count in the camp for two years. 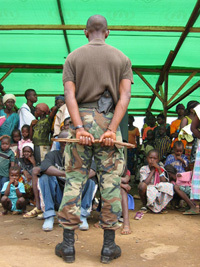 [Guinea] A Guinean soldier maintains order among Liberian refugees in Laine refugee camp, Guinea in June 2004. He was the head of security in the camp. "Food is very important for refugees. As soon as they know they won't get food any more things can turn ugly," said one UNHCR security agent at Kounkan as he waited for the head-count there to resume. Another humanitarian worker in Nzerekore painted a similar picture. "There are a lot (of refugees) who come and go, though they are ready to fight to keep their food intake or their shelter in Guinea,” he said. Refugee cards which entitle the bearer to food packages, were on sale to the highest bidder, he added. One refugee who admitted cashing in his ration card was Mike. “In another life, I used to fight, but now that’s finished. These days I’m just doing business between Liberia and Guinea," he told IRIN, as he sat drinking tea on a wooden bench by the main road in the town of Yirie. "But I'm here in Guinea, I'm still a refugee," Mike stressed, adding that he would still be eligible for rations handed out by the UN World Food Programme (WFP). Back in the regional capital Nzerekore, Pastor-Ortega complained that many Liberians only crossed into Guinea in the hope of claiming a refugee card for the benefits which it conferred. [Liberia] Colonel A B Konneh, former head of intelligence for LURD, now (July 2004) most senior LURD commander in Voinjama. Stoo outside his furniture shop on the high street. Many UN aid workers say the fraud involved in aid distribution to refugees has become so widespread that the situation is no longer tenable. "All the food has gone to the markets, in Guinea and of course in Liberia," one WFP official in Guinea told IRIN. "They diverted the aid, but now we have financial problems and cannot continue like this. Too many of them are fraudsters." It is not just Liberian civilians criss-crossing the border that gives rise for concern. 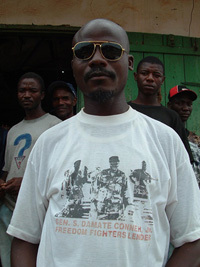 Residents on the Liberian side told IRIN that former LURD combatants come and go across the border without interference. One LURD military commander in Voinjama, Colonel AB Konneh, told IRIN that it was still LURD that issued passes for people to cross into Guinea, not Liberia's transitional government or the batallion of Pakistani peacekeeping troops that is now stationed in the town. Diplomats say Guinean President Lansana Conte was LURD's main backer during the conflict which eventually forced Taylor to quit power and go into exile in Nigeria in August last year. But since Liberia's 14-year civil war came to an end, the rebel movement's fighters have been idle and many have drifted over the border to Guinea. Many residents in Nzerekore told IRIN they were convinced that LURD gunmen who had drifted into Guinea were the source of ethnic clashes in the town last month, during which at least two people died. "Guineans fear that the problems we've seen in Liberia could shift here," said a Guinean government representative in Kouankouan, the nearest refugee camp to Voinjama. Since 1990, Guinea has hosted repeated inflows of refugees and returning Guinean migrants who have been driven by conflict from their homes in Liberia, Sierra Leone and Cote d'Ivoire. According to official UNHCR figures, the country still hosts more than 100,000 refugees, most of them Liberian, and this puts a heavy strain on its own weak infrastructure. Aid workers in northern Liberia confirmed that much of the food handed out to refugees in Guinea was turning up in local markets, where it was helping to make up for local shortages. "Somehow people are managing, coping mechanisms have come into play. People are still getting food in the camps in Guinea - the bulgur wheat is even brought here and sold on the market,” Markus Cott of the International Committee of the Red Cross (ICRC) told IRIN in Voinjama. "But as more people return, it will become more problematic feeding everyone,” he added. UNHCR recently complained that it does not have enough money to begin the large-scale repatriation of Liberian refugees planned for the start of the dry season in October. And WFP has warned donors that it still lacks the necessary cash to keep Liberia's three million population adequately fed until the year end. UNHCR warned last week that it still needed US$23 million to help repatriate Liberian refugees from Guinea, Sierra Leone, Cote d'Ivoire and other West African countries. At the same time WFP said it had a funding shortfall of US$11 million in Liberia. "You cannot have a stable situation if you have over 300,000 people going hungry," warned Justin Bagarishya, the head of WFP in Monrovia. The last census of Liberian refugees in Guinea in 2002 showed there were 90,750 refugees living in official camps and WFP food assistance to them is still being provided at this level. However, UN officials said the new head-count being conducted before the start of the repatriation programme, shows that numbers have dropped sharply. The nationwide refugee census is not yet complete, but UN officials noted that in Kouankan camp, for example, the latest headcount showed the Liberian refugee population had nearly halved to 18,682 from 32,000 two years ago. Conducting the census is a fraught business. At Laine refugee camp, a visiting IRIN correspondent saw tempers boil over as UNHCR workers tried to establish who was a genuine Liberian refugee deserving assistance, and who was making fraudulent claims. 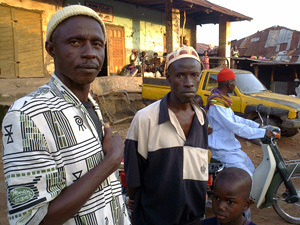 [Liberia] Saliah Fofana (left) and his brother Boakai Sannor have returned to Voinjama after 14 years in Kouankan refugee camp, Guinea. Less than one kilometre away, Liberian refugees could be found selling their food packages at the local market. Guineans, who like Liberians prefer to eat rice , buy the bulgur wheat to feed to their cows, pigs and goats. They buy the refugees's rations of vegetable oil to mix with red palm oil to cook rice and bushmeat. Rebecca, a refugee from Laine camp, admitted to trading her food handouts for cash so she can buy what she really wants to eat. Rebecca told IRIN that many of her friends from the camp went to Liberia "to visit the family” and that she too wanted to get back home as soon as possible. But others, like James Ohkey, the chairman of the refugee committee in Kountaya camp, are more wary. UN peacekeepers are currently trying to disarm an estimated 40,000 to 60,000 former combatants in Liberia, each of whom is being offered a US$300 in cash and the opportunity to go back to school or learn a new trade. Lofa County saw some of the most intense fighting during the civil war and Voinjama, once a bustling border town is now a ruin. The houses on the main street are little more than shells, their walls riddled with bullet holes and damaged by mortar blasts. Everything that could be looted -- doors, window frames, roofs -- has been. It is to this devastation that brothers Boakai Sannor and Saliah Fofana have returned spontaneously from Kouankan refugee camp in Guinea. The brothers said they had come home to begin the big job of repairing the family's gutted home on the high street and sorting out its overgrown farm. But they have left their children and other family members behind in the camps to continue with schooling until the situation in Voinjama becomes more stable. “I was away for 14 years! I don’t know who did what here. I don’t know who’s still got arms and who hasn’t, who was a fighter and who not - all the guns are hidden!” Fofana told IRIN. “(But) we are back because now we are protected,” he added, referring to the Pakistani peacekeeping battalion posted in the town as part of the United Nations' 15,000-strong peacekeeping force in Liberia.